Sometimes there are films that for whatever reason, despite having a lot going for them, don’t entirely work. After all, there is a lot to enjoy about John Carpenter’s second widely released feature The Fog: the stylish vibe of peak Carpenter, the effective synthy score (again courtesy of Carpenter), the intriguing locale of a sleepy California sea town, and the mother-daughter pairing of Jamie Lee Curtis and Janet Leigh. Though despite all this, The Fog just isn’t that scary conceptually. Which doesn’t by any means make it a failure, since as I said, there’s plenty here that makes it a worthy entry from maybe the best horror director of its era. The film opens on a salty old sailor (John Houseman) recounting to some kids around a campfire the tale of these sailors that pillaged and plundered a clipper ship off the coast of the town they live in, Antonio Bay. After learning that the town is on the verge of celebrating its 100th anniversary, we see a ship off the coast of Antonio Bay in present day, where a bunch of sailors are attacked by these ghost pirates after their ship is engulfed in an ominous fog. 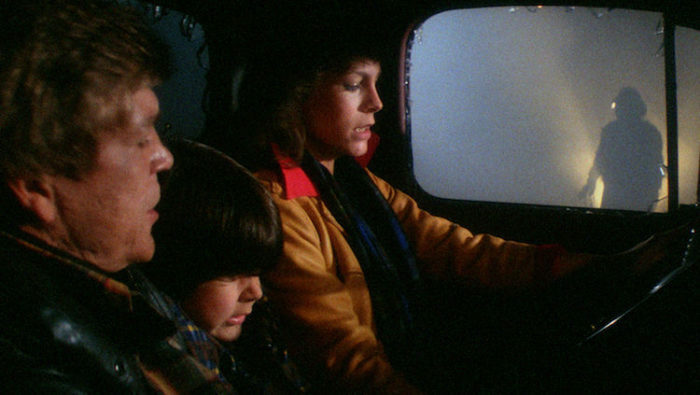 That same night, a townsperson named Nick (Tom Atkins) picks up a hitchiker named Elizabeth (Jamie Lee Curtis), and their car is somewhat destroyed by occurrences that may or may not have to do with the fog that rolled in off the sea. The next morning, we see local DJ Stevie Wayne (Adrienne Barbeau) being given a piece of driftwood by her son that says “DANE” on it, which has come from the Elizabeth Dane, the ship carrying the vengeful ghost pirates. The piece of driftwood starts to spout water which makes voices come out of it on of Stevie’s tape machines, swearing revenge on the town, while the piece of driftwood reads that “6 must die”. Meanwhile, Nick and Elizabeth find the body of one of the murdered sailors, before their story intertwines with Stevie, her son, town priest (Hal Holbrook), and one of the sailor’s concerned wives (Janet Leigh). This of course forming the party of six that must supposedly die. I couldn’t help but notice that this is the second film I’ve reviewed this Shocktober that revolves around some gruesome historical event occurring, which is then destined to repeat itself decades later. The other being Black Sunday, though that one happens two centuries later, while this one happens just one century later. From watching both these films, I’m not entirely sure that this is an effective horror trope (if you can even call it that), just because I’m not sure that it’s based in any kind of societal fear that most people have. Now, I suppose you could say many people can be haunted by the sins of their ancestors, but I’m also not sure that that’s what either of these films are preying on. Instead, this premise comes off as a little too convoluted for its own good. Other than the ghost sailors, the fog that they appear in seems to have some sort of magic connected to it, but the mythology is never super clear. Which I suppose is fine for a low budget supernatural thriller of this sort, since the film is just as interested in seeing people get knocked off with fishing hooks as it is in creating a singular spooky vibe. But the movie has the problem where it seems invested in its fate-driven conceit, and yet doesn’t quite seem able to connect it that directly to what the characters are going through individually. Though the film does a decent job of establishing some worthwhile characters. 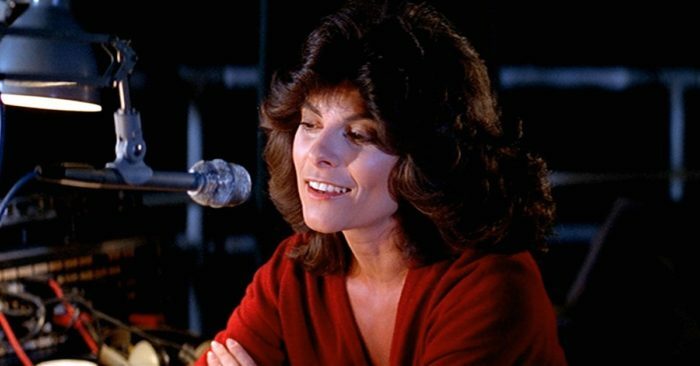 Adrienne Barbeau is particularly good as the town’s DJ, who for some reason broadcasts all of her radio shows in a lighthouse while looking out into the great wide foggy sea. None of the other characters quite have the spark of Stevie Wayne, but I suppose it is always nice to see an older ensemble movie where the female characters are uniformly more proactive than the male characters. Perhaps chock this up to the film being co-written by frequent Carpenter collaborator Debra Hill. Though, ultimately, the idea of salty seamen coming back to kill people because of some prophecy just doesn’t quite feel like something that would get under any moviegoer’s skin. That said, The Fog does a lot to overcome this, with its haunting score and its beachside setting, which feels not so far removed from Jaws or The Birds. So maybe this movie just needed more creepy animals? Instead of… you know, low-lying moisture.